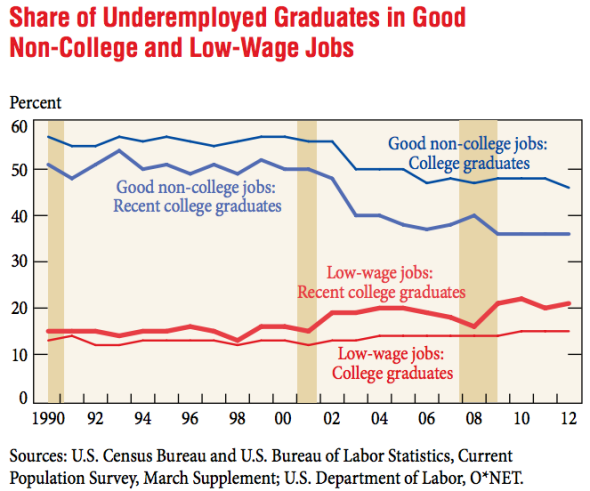 Unemployment and the class of 2014: How bad is the job market for new college grads? 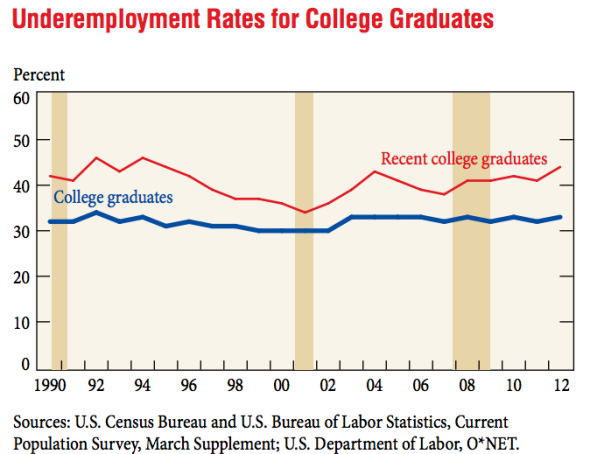 How Bad Is the Job Market for the College Class of 2014? Have a drink. It’s the last you’ll be able to afford. College graduation season is approaching fast, which means we’re also heading for the annual round of horror stories about the job market for young B.A.s. At least, I expect we are, because said market is still a mess. You can spend a long, long time arguing about precisely how bad freshly minted grads have it these days and why. But for now, let’s stick to broad strokes. 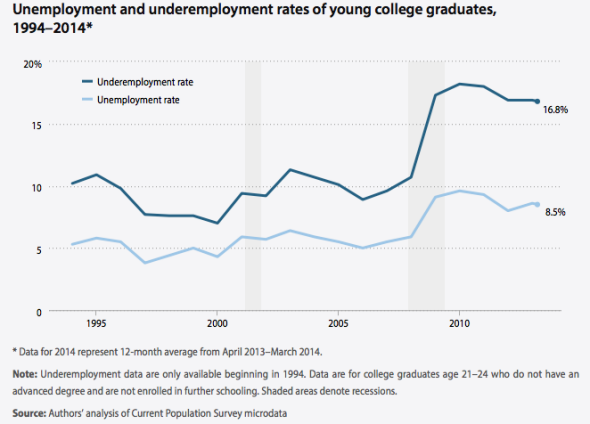 In its recent chartbook on youth joblessness, the Economic Policy Institute reported that roughly 8.5 percent of college graduates between the ages of 21 and 24 were unemployed. That figure is based on a 12-month average between April 2013 and March 2014, so it’s not a perfect snapshot of the here and now. Still, it tells us that the post-collegiate job market, just like the rest of the labor market, certainly isn’t nearly back to normal. (For comparison, the unemployment rate for all college grads over the age of 25 is 3.3 percent, which is also still higher than normal.) More worrisomely, the EPI finds that a total of 16.8 percent of new grads are “underemployed,” meaning they’re either jobless and hunting for work; working part-time because they can’t find a full-time job; or want a job, have looked within the past year, but have now given up on searching. Then there’s the other kind of underemployment—the kind where you’re just too educated for your job. For decades now, we’ve been used to hearing about recent college graduates reduced to pouring coffee or working as bike messengers to pay off student loan debt. 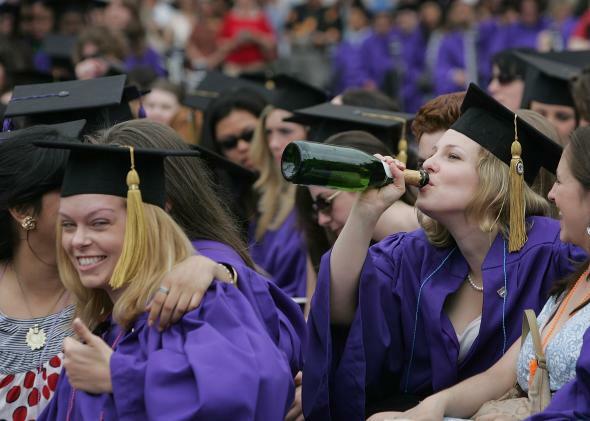 In a January report, the Federal Reserve Bank of New York found that roughly 44 percent of recent graduates—meaning those ages 22 to 27 with a B.A. or higher—were in a job that did not technically demand a bachelor’s degree. That, oddly, was good news: Even in very strong job markets, significant chunks of young grads typically take a while to move on to a career path that matches their education—the situation in 2012 was about on par with the early 1990s. So to sum it up: Today’s crop of new B.A.s are staring at roughly 8.5 percent unemployment, 16.8 percent underemployment. Close to half of those who land work won’t immediately find a job that requires their degree, and for those stuck in that situation, there are fewer “good” jobs to go around. Welcome to adulthood, class of 2014.